Anybody interested in the world of network-attached storage (NAS) will have noticed the rise in popularity of hard drives claiming to be optimised specifically for NAS devices. Touting improved compatibility and reliability, said drives promise to be the perfect companion for a network server, but how are they any different to a regular drive, and should you consider one for your own personal NAS? To shed some light on the subject, we're examining one of the most popular NAS hard drives on the market, the WD Red. What makes a drive Red? Introduced back in 2012 as the world's first NAS-specific drive, the WD Red has the look and feel of a regular desktop drive but is primarily differentiated through a 'NASware' firmware that introduces specific optimisations. Currently at version 3.0, NASware is designed to bridge the gap between general consumer drives and premium enterprise solutions by bringing certain high-end features to mainstream price points. Managing power consumption, stability, temperature and vibration are chief among the priorities for a NAS drive, and WD targets these areas with a number of customisations. Whereas a regular hard drive will frequently spin down and park heads in order to conserve power, a WD Red drive is programmed to disable frequent head-parking in favour of longevity and instead optimises power consumption by balancing rotation speed and caching algorithms; a technology known as IntelliPower. On the stability front, Intelligent Error Recovery Control is used to ensure that certified NAS units wait a defined period of time for transactions to complete in order to prevent the drive from fallout in RAID applications. To help minimise vibration, all WD Red drives are designed using "dual-plane balance control technology" that claims to increase lifespan and reliability, while premium WD Red Pro drives also carry hardware vibration compensation that actively monitors linear and rotational movement. These enhancements can be crucial in a NAS environment, where drives are intended to run 24x7, and WD goes as far as to state that a Red drive will offer a 35 per cent MTBF (mean time before failure) improvement over a standard drive. Backing the claims with a real-world advantage, WD offers an enhanced three-year warranty on all Red drives and a class-leading five-year warranty on Red Pro models. Having initially launched in a 3.5in format, the WD Red product range has since been expanded to include 2.5in and 3.5in form factors, with capacities ranging from 750GB (£50) to a massive 6TB (£225). All new drives naturally come equipped with NASware 3.0, though do be aware that certain older models are not able to upgrade to the latest firmware. Expanding the reach of the Red drive, Red Pro models have been introduced with the addition of improved vibration reduction, making the drives better suited to servers with up to 16 bays. The success of the WD Red has made it a go-to solution for consumers and NAS manufacturers alike. Working closely with its various partners, WD has ensured certified compatibility with many of the most popular NAS devices on the market today, and that alone makes the Red drive a prime choice for NAS deployment. WD has recognised the growing popularity of NAS boxes in both the consumer and business environments and introduced Red drives that are optimised to run for longer periods, with better reliability, and with enhanced warranty support. 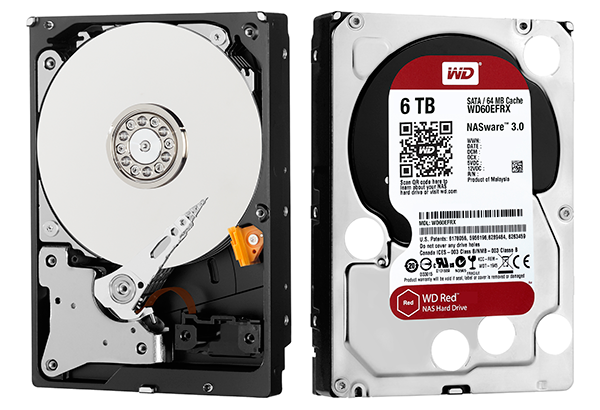 Further information on NAS hard drives is available at the WD Red Product Page and a wide range of WD Red drives are available to purchase from Scan Computers.